Islam News Room - Pumpkin Says Allah? by Sheik Yusuf Estes while visiting Egypt in 2001. Something just happened to cause me to sit down and tell a story that I have kept to myself for a long time. This is really a BIG TEST (ibtala') for me to write about this subject. What I'm about to tell you is strange and I know some of you are going to think "Ol Sheik Yusuf finally went off to 'Goofee Land'." About lies & Muslims who deceive . . .
After all, who is the one that has been attacking the brothers and sisters (hopefully in a kind a respectful manner) regarding putting the fake pictures on the Internet and the stories of weird occurrences in nature which people claim bring them to believe in Allah? I am the very same person who only two years ago went on record as debunking the "Shahadah in the Forest" picture and the "Tree in Ruku'ah Facing Qiblah" picture, and the "Fish with Allahu Akbar on His Side" picture, as well as many others. This goes back to my days of debunking the old fairy tales and lies in the Christian church which we heard from infancy onward. We were told in that if you look down from above on the back of a burro (small donkey) you will see a brown stripe running from his neck to his tail and across his front shoulder is another brown line which forms a 'cross'. Well sure enough some burros do have this type of marking. If you get up high over the donkey and look down and use your imagination a little you will see a brown line intersecting another brown line to form a 'x' or a 'cross' right across his shoulders. Well we were told that before Jesus was born, no donkeys ever had this. (What is the evidence for such a statement?). A donkey carried Mary to Bethlehem while she was pregnant with Jesus and was present in the manager when Jesus was born. (Again, any proof?). A donkey carried Jesus into the city on Palm Sunday (this is in all the gospels in the Bible). So, for all his carrying of Jesus, the donkey gets to carry the 'cross' on his back as an honor for his service. According to this type of thinking, we should all wear a cross with honor and pride. And now today, how many would be happy to wear a cross hanging from their ears, nose, eyebrows, tummy, and tattoo a cross in places which I won't mention? My reason for being against these types of so called 'miracles' is that it has no basis in true belief. I lived all over Texas and Mexico for over 50 years and watched so much superstition over these same types of things that it made me sick of it all. People would claim that they had a tree which would "cry" at Easter time or a statue of the Virgin Mary would "weep" tears. One case a few years back in San Antonio, I recall a window in the front of a home which would show some kind of "crucifixion" or something at a certain time of the night. People would come from all over filling the street and jamming the front yard and falling on their knees praying and crying. People were claiming to be 'healed' of sicknesses and cancer, etc. It was in the newspapers and made quite a sensation -- for a while. But then, after a while the light thing stopped, things went back to usual and people went back to their routine lives of lying, cheating, stealing, adultery, drugs, violence. He told a story without any proof or reference what ever. "This person was had a friend who was very ill and dying in the hospital. So he though he would test if Islam was right. And so he prayed in the 'name of Mohammed' for them to get well, but the person didn't get well. So he prayed in the 'Precious Name of Jesus' and the person got well and was cured of the sickness. And on this statement he based his conclusion for the debate: "Is the Bible the Word of God?" And by the way, when I was a prison chaplain in Texas, I found that the ministries in the prisons there are using the same video tape of Ahmad Deedat and Jimmy Swaggart to call people to 'Jesus.' They all conclude as Mr. Swaggart did, that the only thing that matters is if you get what you want from your prayers. To believe that someone or something has power with Allah or in place of Allah or a connection with Allah is 'shirk' (making partners with Allah, may Allah save us from this). Allah says that He does not forgive that anyone set up partners with Him in worship, but anything less than that He can forgive. This is perhaps the biggest test of all. It is not so much that a person believe that there is Allah. After all, every religion out there claims to believe in God of some kind. Every religion teaches to pray to their gods. Some teach that there is only one god, and that they have pray to god through some other god or some 'icon' which represents or reminds them of god, or it acts as an intercessor between them and god. And some of these prayers to their 'gods' are answered. After all, if they didn't get what they wanted at least once in a while they would not continue to believe in their false gods would they? But who is really the One the ultimately answers their prayers? Who really gives them what they ask for? Who gives them life? Who heals them? Who provides for them? Who is the Only One do all Praise? -- Of course, it is only Almighty Allah. Will we worship Allah, alone, on His terms, conditions and follow His commandments? My point is that these kinds of things seem to me to be more of a test of character than a proof of God's existence. Only those who already believe would come out and get excited. The non-believers just stand back and watch "those crazy fools making idiots of themselves." I have seen people claim miracles in the "Name of the Father"; and in the "Precious Name of Jesus"; and in the "Name of the Holy Spirit." So, now what I am about to say... well, just read it for yourself and judge. NOTE and a word of CAUTION: The story you are about to read it 100% true and I am one of several of the witnesses. We photographed the specimen about to be described, and did serious investigation into the background and history of how this has come about. * This this turned out to be some kind of artificially induced growth on the surface or a reaction to a chemical which was artificially induced (in other words someone may have designed this with a process we have not discovered - yet). * And even if it is absolutely, free from manufactured stimulation, it is not to be used to call people to Islam. It would only be considered a source of increased belief for those who are already believers in Islam. I was in Cairo Egypt, preparing for a visit to a rural area when this strange event just took place. At that time our brother in Islam, Ahmad Mousa, was my host in Cairo. He was visiting a farm about an hour's drive out of Cairo and he found something very weird. He said twenty days before a farmer pulled a gourd shaped pumpkin out of the ground that was facing a different direction than the others, in a strange way. It appeared to have a strange formation of Arabic style letters written across its length. So he obtained it and brought for his brother (my friend Ahmad) to investigate. Subsequently, Ahmad brought it to me a few nights ago. We were with Dr. Fatih Algayreb standing at the trunk of Ahamd's car wondering we would see. As we stood there at the back of his car staring down under the street lamp at the huge vegetation on top of his trunk of his car, I froze. If I had not seen it with my own eyes and held it in my own hands, I would not have believed it. I was so shocked that I almost dropped it when I realized what it said. What can I say? I held it. I touched it. I felt it over and over. It was real. To the right of the words 'Ar Raheem' was a black formation which appeared that if it had been left to grow, the word 'Mohammed' verily likely would have been displayed right along with it. So, now the question is: "What if it had been proven to be a natural phenomenon? What if it was real?" Then what would that mean? Thanks only to Allah that He guided all of us to think and consider the most important points of Tawheed of Islam (monotheism). 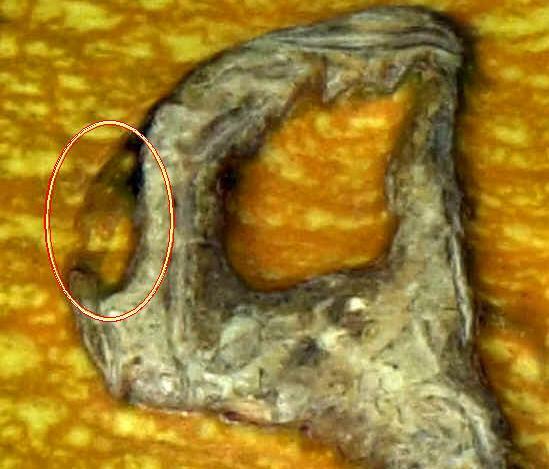 Dr. Fatih Al Ghareeb and our beloved brother Ahmad Mousa were not fooled by this trick on a pumpkin. Not at all. They immediately were suspicious and together we all began investigating this subject. Sheik Mahdi from Al Azhar University was called in and he made a television program with us on Today Islam in which he confirmed that although these types of things appear from time to time, they are not the signs that prove to the believers the existance of Allah. Upon closer examination the truth began to come to light. If you could look at all the other miracles from Allah which He has clearly explained in His Book the Holy Quran, and still need a pumpkin with warts to decide if it is all real, then your faith wasn't much to start with. Don't we see bigger miracles than this everyday? Who created all of the things which we take for granted everyday? Where did we come from? How is the universe in such a splendid order? Where did the heavens and earth come from? Who sends down the rain? Who grows up a pumpkin from a mere seed? Al Rahman -- (The Merciful) These are the ture "miracles" and "signs" of Allah. How would it be if you found a giant watermelon tomorrow and it had seeds in it spelling out "Jesus is King of the Jews" in Latin? Would you want to be a Christian? And would you stop eating the 'sacred melon'? Or what if you discover a rock with "Michael Jackson" spelled in Hindi language? Or how about a pizza that the cheese toppings spell out "IslamTomorrow.com" ?? This would all certainly be most strange and bizarre, but would it cause anyone to change their belief? No. It would only increase the faith of the believers and increase the disbelief of the disbelievers. Now, let us take a closer look at this so called "Miracle." Notice the exact drawing on the pumpkin. This was the path the artist had intended the growth to follow. 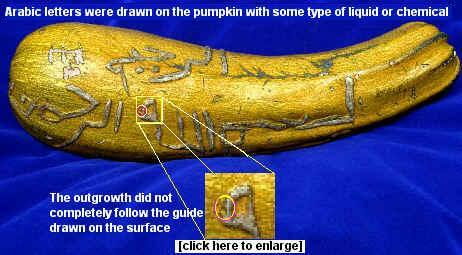 Miracle on a Pumpkin - Or More Lies? May Allah (SWT) Grans you paradise inshAllah!